The capital of India, New Delhi has 13 million inhabitants. A cosmopolitan city, it mingles residential and commercial areas, Hindu temples and mosques. It is crossed by the river Yamuna, and an international airport connects it to various capitals around the world. To get around the city, the traditional rickshaw either motorized or not, is the main means of transport, with the bus and metro services. It is better to visit the city during the dry season, from September to March. You will generally enjoy a warm welcome and hotels and restaurants are easily accessible, sample their local specialties, often very spicy but delicious, like Tandoori or Biryani, accompanied by the well-known but simple chapatis. 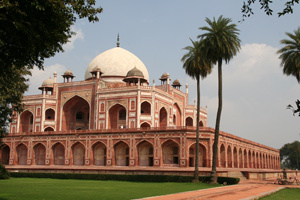 Several places should not to be missed in New Delhi; the streets and the mosque of Old Delhi, the Chandhi Chowk Bazaar, Red Fort, the Muslim Quarter of Nizamuddin, the Dilli Haat market where you can find craftsmen from around the country, and the park at Lodhi Gardens. You may also participate in one of the numerous festivals that take place throughout the year such as the festival of lights in October, or the Holi festival in March. Despite its intense pollution and teeming traffic, you will certainly succumb to the unique charm of this very mixed and diverse megalopolis.